It is a bit belated news but i still find it worthy to point out. Two weeks ago the XENON collaboration posted a paper with new limits on dark matter from direct detection. The paper follows earlier announcements and a note in Nature. It shows the limit on the spin-independent scattering cross section of dark matter on nucleons as a function of the dark matter particle mass. The new limits are better by a factor of six than the previous ones from the CDMS-II experiment. I guess that at this point the controversial DAMA detection signal can be forever buried in oblivion. For reference, the plot shows expected cross sections in the constrained MSSM scenario. Of course, the importance of the XENON10 results goes far beyond constraining the parameter space of some obsolete models. 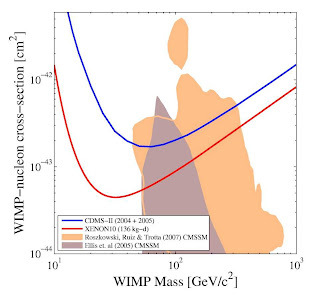 The exciting point is that we are really probing the cross sections expected for WIMP particles. In the coming years we either confirm the WIMP hypothesis or make it implausible. No need to tell that an eventual positive signal would have a huge impact on the LHC program and science fiction literature. And now something really interesting. Angelina Jolie hates George Clooney!!! !